With Day 3 of The Boomsday Project wrapped up, we're starting to see a good variety of decks having a lot of success. Here's a look at the Class Power Rankings after Day 3 of Boomsday. With Day 3, we're starting to see some normalization. Warlock has come down a bit with the player base reacting to the Warlock heavy meta with Odd Rogue and Big Spell Mage keeping the powerful Warlock decks in check. Priest had the biggest improvement with a new improved Mecha'thun Priest coming to light as well as players just getting better at playing the Control Priests. Here's the class rankings based on popularity right now. 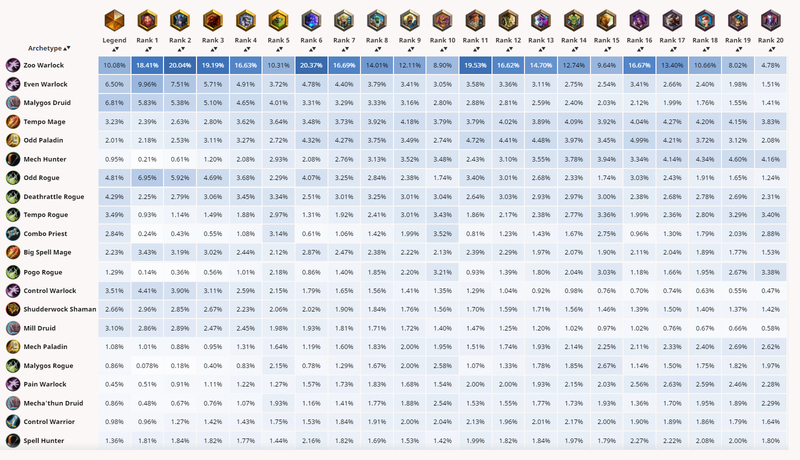 Warlock, Druid, and Rogue are still by far the most popular with these classes having the most variety of decks. 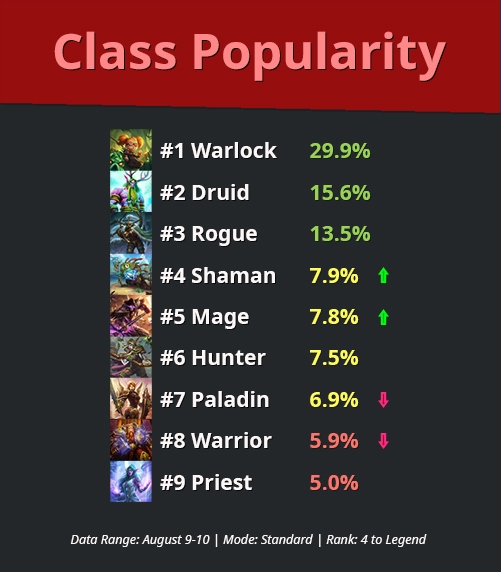 The rest of the classes are starting to even out with Warrior and Paladin dropping a bit and Priest on the rise. # 2x (6) To My Side! Even Warlock (59.2%): This deck continues to show that it doesn't need any new cards to continue succeeding. We're seeing some varieties of Even Warlock, but it's mostly swapping out cards with old tech cards like Black Knight and Skulking Geist . Malygos Druid (58.3%): This deck surplanted the Mill Druid as the best Druid on Day 3. Dreampetal Florist and Flobbidinous Floop are key cards that allow combo decks like this one to flourish with huge discounts to Malygos. Odd Rogue (57.6%): Odd Rogue continues to occupy a key place in the meta keeping the top Warlock decks in check while punishing the greedy decks. Myra's Unstable Element has given this deck an extra level with a massive card draw play where before it would fizzle out. Shudderwock Shaman (57.3%): Shudderwock makes it's first appearance! This deck is a bit of a hybrid between Token and Shudderwock Shaman. Giggling Inventor gives this deck added defense against aggro yet also provides a wider board against slower decks for a big Thrall, Deathseer play. Electra Stormsurge also provides an interesting dual role in the form of 2x damage on Lightning Storm removal against aggro, but at the same time 2x damage on Lightning Bolts to the face against slow decks. Spell Hunter (56.8%): Spell Hunter keeps up it's consistency with having decent matchups all across the board. It's really only a huge underdog against Odd Paladin when we're talking about popular decks. Control Warlock (56.6%): This deck is a great counter for all of the aggro decks particularly against Zoo Warlock. An early Rin, The First Disciple can ruin your opponents combo or control decks. Demonic Project has been a great addition for helping you find more Voidlords and also messing up your opponent's win condition. Zoo Warlock (56.1%): This Zoo Warlock and the new one we featured yesterday are neck and neck. You can't go wrong with either right now when it comes to climbing up the ranks. Odd Paladin (55.9%): Doubling up on Void Ripper has given this deck a better chance against the Druid decks with Spreading Plague. 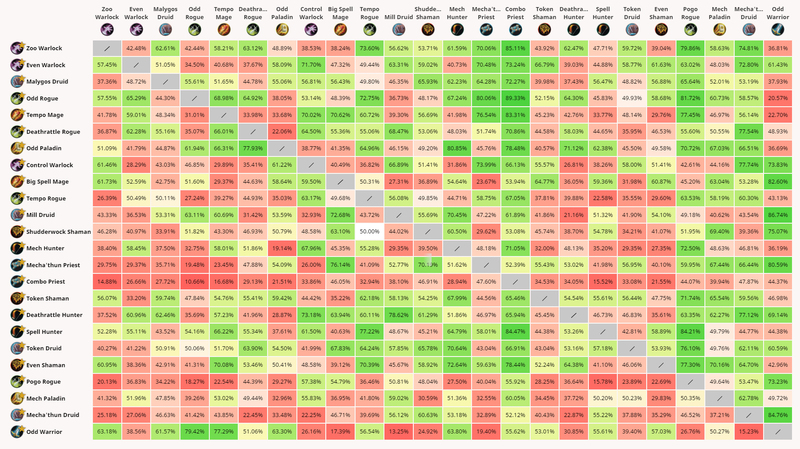 Check out our full matchup matrix here. Sign up for our premium subscription to see the full list and get a lot of other amazing features to help your ladder climb. Day 3 has been a good mix of new and old. 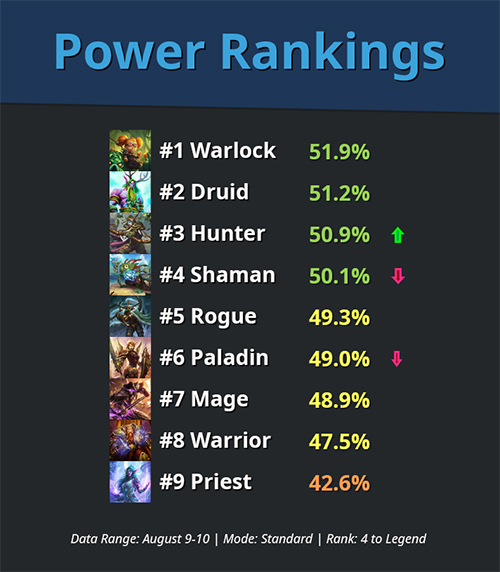 We're starting to see some normalization which is probably a good thing since we've started so Warlock heavy. Try some of these decks out and let us know on Twitter how you fare with them! Mechs are a big part of The Boomsday Project. Let's take a closer look at them and their new mechanic: Magnetic! Day 2 of The Boomsday Project expansion has seen very little change in terms of what classes people are playing.